The medium of instruction will be in English. However, students will be allowed to write the terminal examinations in English or Tamil. The Teacher should have passed any Diploma Teacher Education in any NCTE recognized Teacher Education Program through face to face mode. Two years full time teaching experience on temporary/permanent basis as primary/graduate/post graduate teachers in a primary/Secondary/Matriculation /Higher Secondary School recognized by the State/Central Govt. (within Tamil Nadu State). The required teaching experience of two years must have been completed on or before the last date of submitting the application, truncated two years full time teaching experience in the same or in the more than one school with or without break can also be considered. UG or PG in any one of the subjects: Tamil, English, History, Geography, Mathematics, Physics, Chemistry, Botany, Zoology & Computer Science. PG in Economics & Commerce both U.G. and P.G. must be in the same subject. Selection process will be made on the basis of Percentage of marks scored in 2 years diploma Teacher Education, UG Degree and in-Service Teaching Experience. Prospectus and Application Form can be obtained in person or by post on submission of a request along with a Demand Draft for Rs.500/- towards its cost drawn in favour of "The Director, School of Distance Education", payable at Coimbatore and self- addressed stamped envelope (25 x 35) to the value of Rs.50/-. Candidates can also download the application form and other details from the website www.b-u.ac.in and submit the filled in application with prescribed fee of Rs.500/- in the form of DD. Please note that cash payment will not be accepted. 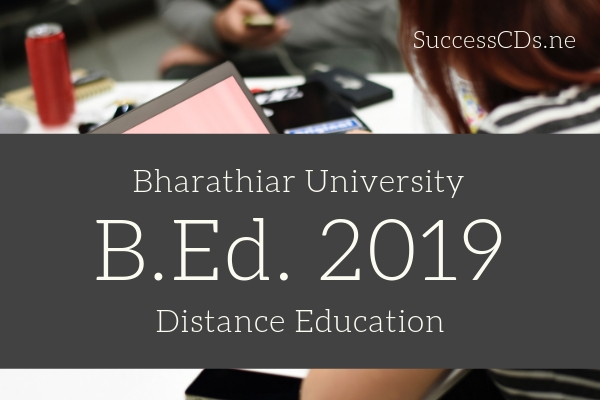 Filled in Application forms should be sent to "The Director, School of Distance Education, Bharathiar University, Coimbatore-641046"
The envelope may be superscripted as "Application for B.Ed."